Süleyman Demirel University, Journal of Graduate School of Social Sciences which is an international refereed journal has been active since 2005. Our journal is issued four times in a year: March, June, September and December. Our journal aims to share national and international studies with scientists about history, sociology, philosophy, philology, geography, archeology, art history, law, political science, international relations, economics and fine arts.Our journal also includes translation, book introduction and criticism besides specific researches, discussions and compilations in Turkish and other languages. 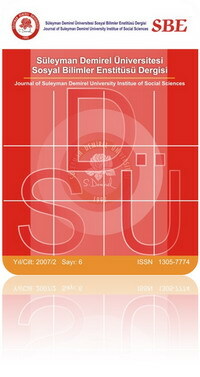 Süleyman Demirel University, Journal of Graduate School of Social Sciences take part in national and international indices such as Akademia Social Sciences Index (ASOS), Business Source Corporate Plus (EBSCO), Scientific Indexing Services (SIS), Turkish Education İndex (TEİ), Directory of Research Journals Indexing (DRJI), Akademic Resource İndex (ResearchBib), Journal Factor, CiteFactor, Information Matrix for the Analysis of Journals (MİAR), Index Copernicus (IC), Social Sciences Citation Index (SOBİAD).